Stop peddling your poison to the masses. Last night I was heartsick to see that, instead of any move to cease and desist, former BOE candidate Mavourene Robinson is taking her poisonous views and trying to go viral. She has started a Change.org petition. Demands: Please immediately stop the expansion of this agenda in Elementary and Middle schools. Please immediately implement policy and standards requiring public review of all curriculum, videos & programs that include LGBTQ, and requiring parental signature of approval at the Elementary, Middle and High School levels BEFORE children are exposed to LGBTQ curriculum. There is no LGBTQ indoctrination in our schools. This entire petition is based on a lie. Ms. Robinson continues to put forward the false premise that respecting the civil rights of LGBTQ students is somehow sexual in nature and something that parents can “demand” to shield their children from. This is more of the same. Public school are for all children and for all families. Ms. Robinson’s petition seeks to make life harder for an already dangerously vulnerable student population. 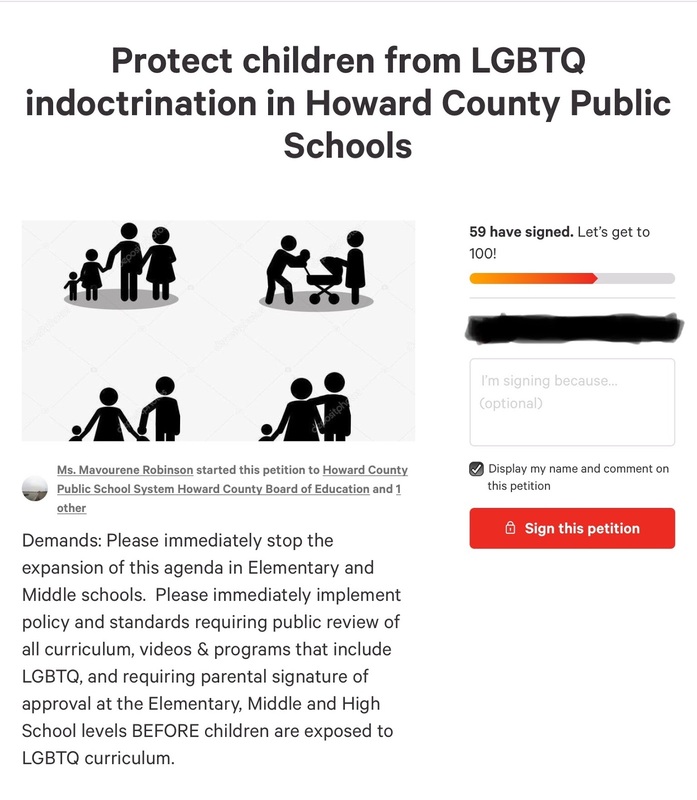 Even learning that there is such a petition circulating is hurtful to LGBTQ students and parents. Imagine if someone were circulating a petition, the sole purpose of which was to deny your basic rights to be seen and accepted as a student at school. I don’t ordinarily tell my readers what to do. Today I’m going to come close. 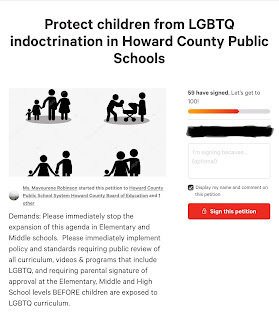 If you find this petition as hateful and unacceptable as I do, click on this link to view the petition, DO NOT CLICK THE RED BUTTON. Scroll to the bottom where you see these words: report a policy violation. Click on the link and report this petition for hate speech. Don’t worry that clicking on the petition link itself will automatically cause you to sign it. 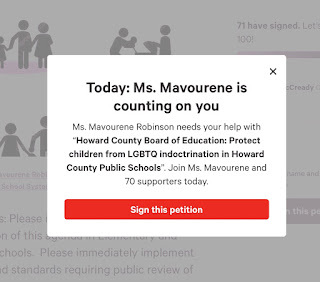 You may see your name/image appear but you have to actually click the big red “sign this petition” button to make that happen. Schools must be a hate-free zone. Right now we know that LBTQ students are more likely to drop out, try to harm themselves, or die by suicide. This is a crisis we should be responding to with more supports, more positive intervention. And much, much more acceptance. I would love to see Howard County responding to these “demands” by shutting them down.